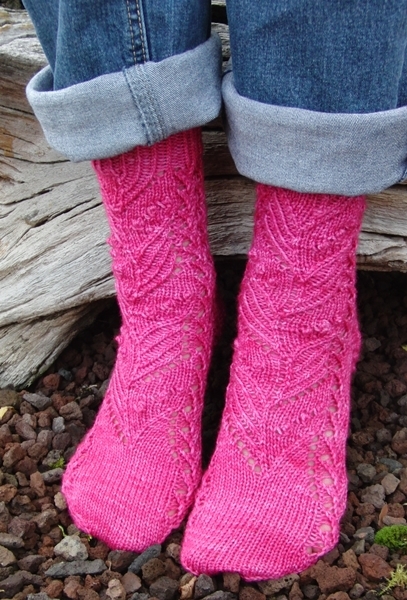 Morning Dew Socks - monemades Webseite! It took me a while to rework the pattern, because I wasn't quite happy how it was laid out in the magazine. I do understand the restrictions there are in this kind of publication, but as a knitter I find it quite confusing when I have to work from different charts or different sets of written instrucitons within one round. So the new pattern now is fairly long, but there are big charts and individual sets of written instructions for each size, which make it much easier to follow the pattern. I hope you'll like the new and improved pattern just as much as I do. The pattern is available from my Ravelry store, here.